Input text: a tiny ball. 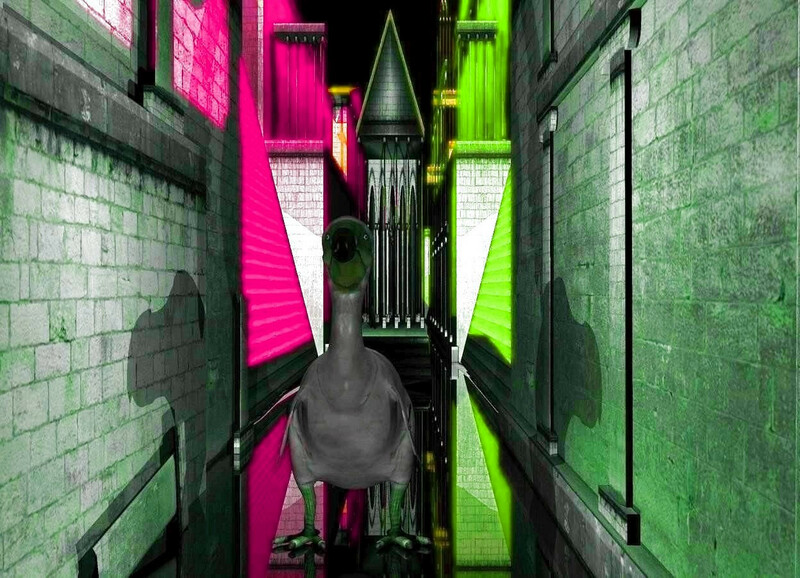 a 20 feet tall dodo is 100 feet behind the ball. the ground is translucent. the ground is 200 feet high and 250 feet wide. it is night. a 1st red light is 500 feet above and 300 feet left of the dodo. a 2nd blue light is 500 feet above and 300 feet right of the dodo. the camera light is black. a 3rd dim white light is 2 feet in front of and 1 feet above and 1 feet left of the dodo. a 4th dim white light is 2 feet in front of the dodo. a 5th dim white light is 2 feet in front of and 1 feet above and 1 feet right of the dodo. don't go too far down that dark alley alone. . .